NASA will reactivate a hibernating satellite to scan the inner solar system for nearby asteroids and other objects, including potential destinations for human exploration, the space agency announced Wednesday. The Wide-field Infrared Survey Explorer, or WISE, launched in December 2009 on a $320 million astronomy mission to seek out cool dust-shrouded stars, luminous distant galaxies and numerous asteroids and comets, particularly objects difficult to find in optical surveys from ground telescopes. NASA put WISE in hibernation in 2011 after 13 months of science observations, but the agency kept the option to resume operations if funding and a compelling scientific purpose materialized. The new mission, known as NEOWISE, follows two months of dedicated asteroid searching by the WISE spacecraft after its primary mission ended in October 2010, when the telescope's reservoir of frozen hydrogen ran out. The hydrogen chilled two of WISE's infrared detectors to minus 447 degrees Fahrenheit, making the instrument sensitive to some of the coldest objects in the universe. But two of WISE's detectors do not require cooling from frozen hydrogen, and they remain useful for an asteroid survey. 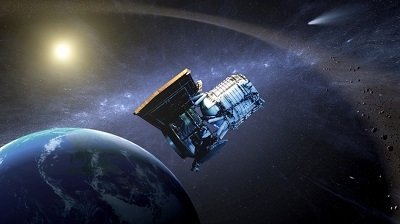 Amy Mainzer, NEOWISE's principal investigator at the Jet Propulsion Laboratory in California, said NASA asked the NEOWISE team for a proposal to revive the spacecraft to continue its hunt for near-Earth objects, or NEOs, bodies which orbit within 28 million miles of Earth's path around the sun. NASA approved three years of funding for the NEOWISE asteroid survey, and the project will receive $5 million each year, according to Dwayne Brown, a NASA spokesperson. "We expect to contact with the spacecraft in September," Mainzer said in a written reply to questions. "The spacecraft has its solar arrays pointed at the sun right now, but it is looking at the Earth for half of each orbit, so the payload has warmed up. When we resume contact, we will resume pointing away from the Earth, and the payload will start cooling down again." WISE flies more than 300 miles above Earth in a polar orbit and the spacecraft's 16-inch telescope will need to cool down detect asteroids. "We expect this process to take several months until it's cool enough to take infrared images," Mainzer said. "Then we will need to go through a checkout to recalibrate the instrument, after which point we can begin survey operations." WISE discovered more than 34,000 asteroids in the main belt between Mars and Jupiter, 135 near-Earth objects and 21 comets during its initial observing campaign in 2010 and 2011, according to a NASA press release. In three more years of observations, NASA expects WISE will discover another 150 near-Earth objects and study the size, albedo and thermal properties of 2,000 more. NASA officials said some of WISE's targets could be candidates for the agency's asteroid retrieval initiative, which would grab a nearby object and bring it to the vicinity of the Earth for research and reconnaissance by astronauts. Infrared survey missions like WISE are prolific asteroid hunters because they scan the whole sky and can see darker, colder objects than telescopes collecting visible light. Many asteroids are hard to see - some as dark as charcoal - but infrared telescopes can still resolve those objects. WISE's primary mission catalogued more than 560 million objects in space, ranging from faraway galaxies to nearby asteroids and comets. The observatory collected more than 2.7 million images. "The data collected by NEOWISE two years ago have proven to be a gold mine for the discovery and characterization of the NEO population," said Lindley Johnson, NASA's NEOWISE program executive. "It is important that we accumulate as much of this type of data as possible while the WISE spacecraft remains a viable asset."